The world's biggest architecture firm has proposed moving the UK's Lords and MPs into a bubble-like building on London's River Thames to reduce the cost of refurbishing the crumbling Palace of Westminster. Gensler, which has one of its largest offices in London, wants to create a 250-metre-long and 42-metre-deep temporary parliament building from steel modules and a wooden frame clad in curved panels of glass. The modules would be made by British shipbuilders before being transported along the River Thames and assembled on steel platforms behind the neo-gothic Palace of Westminster. 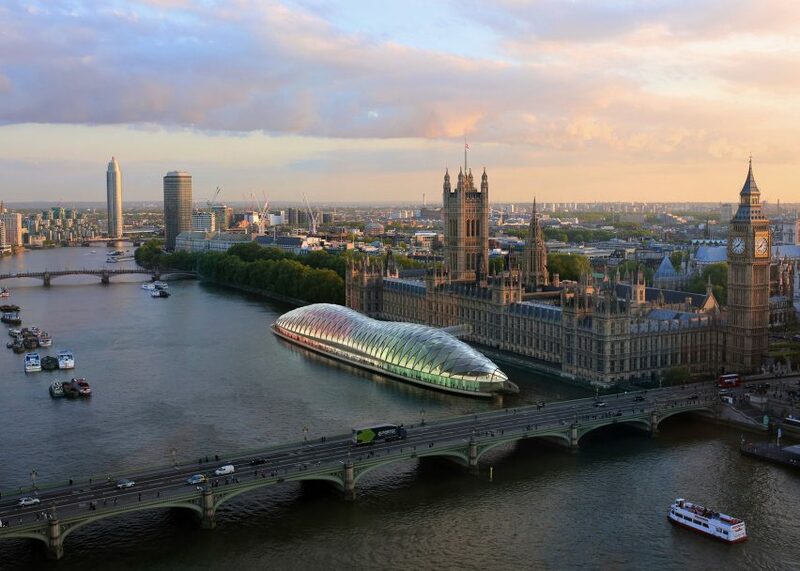 The floating building would be shaped like an elongated bubble, and separated into two areas internally – one for the House of Commons and one for the House of Lords. These would be expressed externally by two gentle bumps at either end of the structure. Gensler's concept is based on the hammer-beam roof of Westminster Hall, the roof of the Palace's oldest building, which is the largest medieval timber roof in Europe and was commissioned in 1393 by Richard II. "The building would be a dramatic, high-tech, wooden-framed structure covering 8,600 square metres, which would provide all the necessary environmental and acoustic containment," said Gensler. "The structure would add a new iconic landmark to London and would not impact the protected vista of the Palace of Westminster from the summit of Parliament Hill." Built between 1840 and 1870, the Palace of Westminster – also known as the Houses of Parliament – was designed by Charles Barry and Augustus Pugin. It contains the remnants of much older structures that date back to the 1000s. It is now in urgent need of refurbishment work estimated to cost between £4 billion and £7 billion. MPs and Lords will be relocated for at least six years to enable the project. Gensler said its proposal would cost around £160 million, representing a £1.8 billion saving in decanting and rental costs, and could be relocated for use elsewhere once the refurbishment work was complete. Legacy uses suggested by the architects include turning the building into a museum of democracy. It would sit within a traffic exclusion zone that is already established around the Palace, and the river would act as a natural moat to provide security for MPs, said the architects. "The concept provides a simple solution to what is a very complex problem," said Gensler managing director Ian Mulcahey. "The challenge has been to find a location that enables all the key components of Parliament to be located together in close proximity to the wider Government estate in Whitehall." "The Palace of Westminster is one of the most important symbols of democracy in the world," he added. "This scheme provides a powerful expression of continuity and reinforces the UK's world-leading creative expertise." Earlier this year a government committee established to investigate the condition of the Palace of Westminster found that the building was facing an "impending crisis" and was at growing risk of a "catastrophic event". Work is expected to start on the refurbishment after 2020, but the complexity of the project has already led to reports of delays. Gensler employs more than 5,000 staff across its 46 offices internationally. It was named the world's biggest architecture firm this year by the annual World Architecture 100 survey. Its recent projects include the world's second-tallest building, the Shanghai Tower in China. In 2015, it proposed turning London's abandoned tube tunnels into a subterranean network of pathways that generate electricity as people walk and cycle through them.